Caution Do not edit the default KPS tables in Policy Studio unless under strict supervision from Axway Support. This includes the API Server, OAuth, or API Portal KPS tables available under Environment Configuration > Key Property Stores. In the Policy Studio tree, under Environment Configuration, right-click Key Property Stores, and select Add Key Property Store. Name: A collection must have a unique name in the API Gateway group. Description: You can provide an optional description. Alias prefix: You can also specify an alias prefix, but in normal usage, you can leave this field blank. 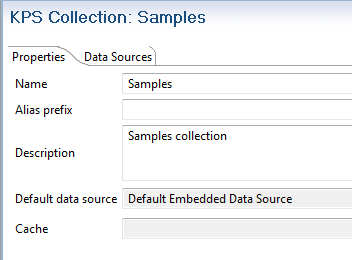 Default data source: A collection has a default data source where all data for all tables in the collection is stored. You can change this data source or assign a different data source to individual tables in the collection. When the collection is created, you can specify a Cache for storage and retrieval of selector results. This will improve selector read performance for storage backends such as databases. For more details on API Gateway caching, see the API Gateway Policy Developer Guide. Note Only local caches are supported. Right-click a KPS collection in the Policy Studio tree, and select Add Table. Name: A KPS table must have a unique name in the collection. Override the default data source with the following: You can specify a different data source than the collection if required. KPS tables are accessed by aliases. A table must have at least one alias. Aliases must be unique in an API Gateway group. You also can use the optional alias prefix for the collection to help ensure that the alias is unique. The full alias of a table is the collection alias prefix and the table alias combined. For example, samples and User gives samplesUser. If unspecified, the default value of the alias prefix for the collection is an empty string (for example, User only). A KPS collection has one active data source associated with it. All tables in the collection use this data source by default. 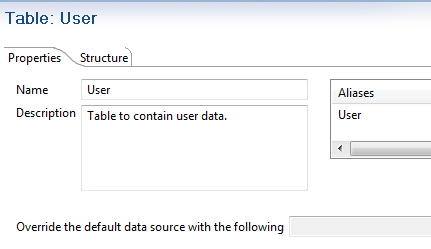 You can configure a table to use a different data source if required (see Configure a KPS table). Java List of any one of the above Java types. Java Map. The key can be any one of the above Java types. The value can be any one of the above Java types. Note Do not use just key as the property (column) name, because this causes deployment errors. You can directly access records in a table by specifying certain property names and values, without needing to read all the records in the table. You can use only properties of String, Long, and Integer types for this purpose. These properties are known as indexable properties. Indexed properties include primary keys, secondary keys (which are indexed implicitly), and other properties that you explicitly select as Indexed in Policy Studio. You can directly access any record using its primary key. All records in the table must be accessible using unique primary keys. You must select one Primary Key per table in Policy Studio. The specified property must be an indexable property. Primary key values cannot be null. You can optionally access any record directly using a unique secondary key. The secondary key can be a simple key (for example, email ) or a composite key (for example, appId or companyId ). The specified properties must be indexable properties. The secondary key (and parts of a composite secondary key) cannot be null. You can specify one secondary key per table. A common use case is to specify an internal unique ID as a primary key, and an external user facing ID as a secondary key. For example, id for internal primary key, and email for external ID as a secondary key. You can access records in a KPS table using an API Gateway selector. If a secondary key is defined for the table, you must specify all secondary key values in the selector. If no secondary key is defined, you must specify the primary key value instead. In Policy Studio, you can specify a secondary key or a primary key in the Use the following property name(s) for looking up a table from a selector field. In Policy Studio, you can select that String fields are Auto-generated. When a record is created, a Java java.util.UUID is assigned to the field if it is empty. Note Values for auto-generated fields can be supplied and modified by users. KPS only generates a value at creation time if no value is already present. In Policy Studio, you can select that String fields are Encrypted in storage. However, fields selected as Indexed (including primary and secondary key fields) cannot be encrypted. You can enter values for encrypted fields using the API Gateway Manager or the kpsadmin command. These values are forwarded to the API Gateway in the clear using the KPS REST service, and encrypted before being written to storage. Note The KPS REST service must always run over HTTPS (the default). You must set an encryption passphrase for the API Gateway group, because this is used in the encryption process. For more details, see the API Gateway Administrator Guide. When KPS tables are accessed using API Gateway selectors at runtime, encrypted fields are automatically decrypted. Selectors do not need to be aware that particular fields in a table are encrypted in storage. When KPS tables are read using the REST API, data is always returned in its encrypted state. Sometimes you may need to view decrypted data to help debug problems on an API Gateway. You can do this using debug mode in kpsadmin. This requires you to enter the passphrase for the API Gateway group. If the in-built KPS encryption mechanism does not suit your needs, you can encrypt and decrypt data outside the KPS. In this case, you should not select properties in KPS tables as encrypted in Policy Studio. Encrypted data must be string-encoded for storage (for example, base64-encoded). Selectors that access the data must decrypt it themselves (for example, using a dedicated decryption filter in Policy Studio).